In Finland, Prime Minister Jyrki Katainen faces discontent within his governing coalition as well as pressure from a nationalist opposition group, the True Finns, which rode euro-skepticism to big gains in April parliamentary elections. European government officials say they have to take Finland’s concerns seriously. Posted by Kindred Winecoff at 5:33 PM . If the US wants more foreign inflows into stock, it should reduce the non-resident dividend tax rate from the very high 30% that it is today. Currently, foreign investors are encouraged to invest in US treasuries since the interest is tax-free but not in US stocks. Since my country of residence has no dividend or capital gains taxes, it generally makes more sense for me to invest in British, Brazilian and Indian stocks (0% tax) and to some extent in Chinese stocks (10% dividend tax). Krugman's on the same page. I will say that Krugman (and plenty of others from all along the ideological spectrum) are wrong to ridicule people who talk about "debasing the dollar" for not knowing what they're talking about. That's exactly what they (the expansionists eg Krugman) mean when they talk about currency devaluation and/or increased inflation for a sustained period, but they just call it "monetary stimulus". It might be good for the economy in aggregate, but it won't be good for everyone and those political cleavages obviously matter. They often make the case that monetary stimulus would be good in aggregate, but usually without recognizing that there is a group of people that genuinely wouldn't benefit from debasement, and this group is much broader than the "rentier class". It includes every consumer, eg. Ron Paul and Paul Ryan aren't loonies for noticing that, even if they're highly selective in their argument. It's fine to ridicule Rick Perry as a loony detached from reality though, because no matter what the Fed does w/r/t QE3 it won't be treason and doesn't deserve the Texas special. Probably won't get to blog these properly, but they deserve attention. -- Sad that this is necessary, but Barry Eichengreen discusses why a return to the gold standard is probably impossible, and not at all desirable anyway. -- "The network of global corporate control", a very interesting research paper. -- "The Convulsions of Political Economy", an application of Marx to the current environment from an unlikely source: a Senior Economic Advisor at UBS. 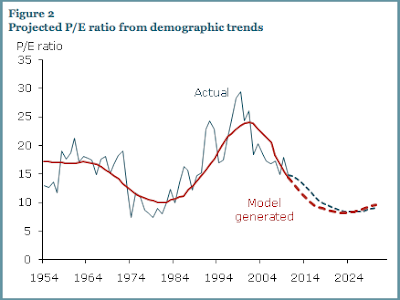 Will US Equity Values Decline Because of Demographics? Posted by Kindred Winecoff at 4:07 PM . Despite theoretical ambiguities, U.S. equity values have been closely related to demographic trends in the past half century. There has been a tight correlation between population dependency ratios, such as the M/O ratio, and the P/E ratio of the U.S. stock market. In the context of the impending retirement of baby boomers over the next two decades, this correlation portends poorly for equity values. Moreover, the demographic changes related to the retirement of the baby boom generation are well known. This suggests that market participants may anticipate that equities will perform poorly in the future, an expectation that can potentially depress current stock prices. In that sense, these demographic shifts may present headwinds today for the stock market’s recovery from the financial crisis. What this is basically saying is that stock market prices (relative to firm income per share) have tracked US demographics relatively closely over the past few decades. This is bad news for those invested in US equities because the US population is getting older, which means that there is likely to be more people seeking to sell equity investments to fund retirement than people looking to buy. If the supply of equities for sale shifts right, and the number of people with enough wealth to demand equities shifts left, then the price of equities is likely to fall. That's what the "model generated" portion of the graph above is showing. But I don't buy it. As Ryan Avent notes, demographic trends are no secret, yet if supply is going to outstrip demand when retirees liquidate their equity portfolios the markets don't seem to have internalized the expectation. More importantly, it's not clear to me that US demographic trends are the most relevant variable going forward. Capital is more internationalized now than at any point in history, and there are many more people in the global middle class than ever before, a trend that is expected to continue over the next 2-3 decades. For many of these people investing in US equities will be attractive, especially if the prices are low. Let's also remember that the US runs a very large current account deficit and is likely to continue doing so for the foreseeable future. That will have to be offset with financial transactions, and equities are one way to do that. The authors mention the possibility of increased foreign ownership in passing, but it doesn't factor into their methodology. I think it probably should. Political scientists can't predict political behaviors, sociologists can't predict social movements, economists can't predict economic crises, biologists have no idea how many species there are, and let's not even mention meteorologists. We're a really dumb species. I meant to write about Rick Perry's idiotic "treasonous" comment but was occupied with other things. In any case, what Karl Smith said. Perry's comments aren't completely out of the blue. Over the past few years we've increasingly seen how politicized the Federal Reserve is and how that can affect macroeconomic and regulatory policy. In mid-2009, polls showed the Fed was the least-popular major US agency, below even the IRS. Late last year a majority of Americans wanted the Fed audited or abolished. Among elites, Fed-bashing is practically a cottage industry on both sides of the ideological spectrum. Obviously Ron Paul and the anti-inflationistas hit the Fed hard from the right for debasing/devaluing/inflating or something, while progressives like Yglesias and others advocate a Fed more dedicated to fighting unemployment. Part of this politicization comes from the Fed's dual mandate and the classic Phillips-curve inflation/unemployment tradeoff that tends to separate the right from the left*. The Fed has also come under fire from both right and left over its role as regulator. The left finds the Fed completely derelict in its duty during the housing and derivates booms of the 2000s. The right accuses the Fed of regulating the banking system too much and favors various versions of free (or freer) banking. The left attacks Greenspan and Bernanke for being to laissez-faire. The right attacks Bernanke (a Republican and Bush appointee) for being too activist and trying to get Obama re-elected. International regulatory requirements such as the new Basel accord may not be fully implemented as pressures on American and European banks persist. Now Bank of America may be going down again. These political battles have arguably hamstrung the institution. Peter Diamond, a Nobel Prize-winning economist, withdrew his nomination to the Fed when it became clear that he wouldn't receive approval in the Senate because he prioritized unemployment in his academic work. Obama has responded to the political climate by simply refusing to nominate anyone to fill key seats on the Board of Governors, despite the fact that the Fed is under greater pressures now than at any point in the past 30 or more years at least. Some on the right (eg Sumner) and left (eg Krugman) believe that Bernanke's prior academic work suggests that he would pursue a much different monetary policy were it not for opposite from the Board of Governors and, possibly, politicians. Not all of these politics are clearly partisan. Both the far right and the far left strongly oppose the bank bailouts that heavily involved the Fed, and we found out yesterday that they were larger than previously thought. (Typical response: "[T]he Fed's secret bailout comes out to the same amount U.S. homeowners currently owe on 6.5 million delinquent and foreclosed mortgages. The progressive take on this story will be that the Fed has preferenced Wall Street over Main Street by using its exceptional authority to extend trillions in loans to banks without offering similar guarantees to underwater home owners.") Even worse for populists on both sides of the aisle is the fact that the Fed offered plenty of funds to non-American firms. And yet we hear all the time about how the Fed is a technocratic institution, supposedly insulated from politics so it can set perfect policy from a dispassionate distance, thus correcting time inconsistency problems associated with the democratic election calendar. We hear it from academics who do empirical work on macroeconomics and politics, from government officials, and from our textbooks. We hear it from centrists who want to believe that it's true. But it's not. The Fed is not only politicized; it is political. Every action taken benefits some group in society, often at the expense of another. Every policy choice has distributional consequences. Since the Fed is ultimately responsible for the health and well-being of the financial system, we can generally assume that the Fed will prioritize actions that benefit financial firms over other goals. And then they do. And then we claim to not understand what they're thinking. But that's the job that they've been given. All of this is even more true of the European Central Bank. *There's lots of work in political science and economics on this. See, eg, the classic Nordhaus (1975) article, Hibbs (1977), Alesina (1988), Milton Friedman's 1976 Nobel lecture, and plenty of others. There are some problems with this literature, but as a crude first-cut at monetary politics it's a good starting place. There are two fundamental reasons why the Chinese government might choose such a policy: reducing its portfolio risk and containing domestic inflation. There are obviously political interests in China for keeping the RMB's value low, but the most recent Five-Year Plan calls for increasing households' purchasing power above the rate of economic growth. We may start to see (more) political cleavages in China pitting consumers and against producers. Remember: politics exists even in authoritarian regimes. We analyze disagreements over de facto exchange-rate-regime classifications using three popular de facto regime data series. While there is a moderate degree of concurrence across classifications, disagreements are not uncommon, and they are not random. They are most prevalent in middle-income countries (emerging markets) and low-income (developing) countries as opposed to advanced economies. They are most prevalent for countries with well-developed financial markets, low reserves and open capital accounts. This suggests caution when attempting to relate the exchange rate regime to financial development, the openness of the financial account, and reserve management and accumulation decisions. They do not cite this paper by Guisinger and Singer, which they should. Nor do they include the Aizenmann-Chinn-Ito "trilemma indexes" in the analysis, which they probably should. Still potentially interesting for those who do quantitative work involving exchange rates. This paper proposes a new mechanism by which country size and international trade affect macroeconomic volatility. We study a multi-country, multi-sector model with heterogeneous firms that are subject to idiosyncratic firm-specific shocks. When the distribution of firm sizes follows a power law with an exponent close to -1, the idiosyncratic shocks to large firms have an impact on aggregate output volatility. We explore the quantitative properties of the model calibrated to data for the 50 largest economies in the world. Smaller countries have fewer firms, and thus higher volatility. The model performs well in matching this pattern both qualitatively and quantitatively: the rate at which macroeconomic volatility decreases in country size in the model is very close to what is found in the data. Opening to trade increases the importance of large firms to the economy, thus raising macroeconomic volatility. Our simulation exercise shows that the contribution of trade to aggregate fluctuations depends strongly on country size: in the largest economies in the world, such as the U.S. or Japan, international trade increases volatility by only 1.5-3.5%. By contrast, trade increases aggregate volatility by some 15-20% in a small open economy, such as Denmark or Romania. Does this contradict the PSST story in the case of the stagnating US economy? Posted by Kindred Winecoff at 6:58 AM . Slaughter: Transnational networks are changing international politics by weakening or changing the role of the state, and this mostly leads to Pareto-improvements. Drezner: Yeah, maybe, but states are still by far the most important actors in global politics and on many big-ticket items transnational advocacy networks have had little discernable effect. To the extent that non-state networks matter, it's largely because they change state preferences, not that they make states less relevant. Farrell: Networks form for distributional reasons and states often cannot control them. In fact, states themselves are networks of politicians and bureaucrats. Networks transform politics via a complex process of contagion which is very difficult to predict ex ante. Obviously some nuance is missing in these characterizations, but I think that's the gist of the argument. I have sympathy for all three views, but my own belief is that international politics operates somewhere in the space between Drezner and Farrell. That is, I think that networks play important roles in shaping international politics, but I think that their influence is best understood within the context of the state system. And despite the fact that international politics is comprised of a series of complex networks that interact, I don't necessarily think that "contagion" is the best way of thinking about these processes in all cases, nor that network behavior is a fundamentally mysterious phenomena. Farrell and others cite the Arab Spring as a good contemporary example. According to one view, the "Arab Spring" is a "black swan" -- a rare event that is essentially unpredictable. I think Farrell would modify the Blyth-Taleb story about probability distributions into a network context, where "black swans" are now viewed as shocks to networks that diffuse through the system in idiosyncratic ways. In some cases the network may be transparent enough that we can predict how extreme shocks might affect the network, but in other cases we won't have that information, and anyway we can't know when or how the shocks will occur. In this view the Arab Spring is a phenomena that cascaded across state borders in a way that states could not understand much less control. Factor in social media and other coordinating devices -- which are networks themselves -- and it gets messy very quickly. But the alternative view of the Arab Spring, which I believe is more or less the dominant view of those who study contentious politics, is that diffusion dynamics themselves are not enough to explain when revolutions succeed or fail. * Quite often it is the decisions of centrally-located actors that play the most significant role. For example, the Egyptian revolution succeeded because the military chose to protect the protesters in Tahrir Square rather than killing them, and because key international allies pulled support from the Mubarak regime. The attempted revolution in Bahrain failed because the state, with support from foreign allies, was able to mobilize the military to put the insurrection down. This story isn't about cascading network spillovers infecting international politics in chaotic ways, but about the ability of governments to do what is necessary to keep elites on their side. In Libya, the revolution was likely to fail without international intervention. In Egypt, international intervention was almost non-existent. But in each case there are clearly-identifiable actors operating within the network that are having an important effect on outcomes. In at least some cases their behavior may be predictable by either interest-based or ideational approaches. Perhaps most significantly, to my knowledge there is no evidence that the Arab Spring is an internationalist movement rather than a series of local movements that have arisen somewhat idiosyncratically. Networks played an important role in organizing protesters domestically, but there didn't seem to be any similar network coordinating actors at the regional level, and not all Arab countries have experienced prolonged protest periods. This is what I was referring to above when I said that contagion stories can only take us so far. A contagion story would have to be able to explain why protests spread from Tunisia to Egypt and elsewhere in 2011, but not from Iran in 2009. Or why protests spread from Tunisia to Egypt to Syria but not to Jordan or Lebanon. Or why reforms in Morocco appear to have been accepted by the populace, while they were rejected in Syria. In other words, there appears to be plenty of room for some sort of two-step analysis when determining how, when, and why social movements diffuse through the system. Which actors are the most important may be a function of network characteristics, but quite often the relative importance of different actors is knowable ex ante. As a critical central node in Egyptian society, no one was surprised when the defection of the Egyptian military tipped the scales in the revolutionaries' favor, and it seems that protesters believed early on that such a defection was likely if the crowds could sustain momentum for awhile. This belief provided just the motivation needed to sustain that momentum. Similarly, if we think about why the US financial crisis led to a global recession while the Swedish crisis in the 1990s did not, we can look to network characteristics of the global financial system and immediately see that the US is a much more important node than Sweden. We could then consult network theory that suggests that in highly unequal systems that are tightly inter-connected, networks are robust to shocks in the periphery but fragile to shocks in the core. Contra Farrell then, having a grasp of how networks behave and what the financial network looks like thus makes even complex phenomena like the financial crisis much easier to understand. Despite all of that, I think Farrell is much more right than wrong in emphasizing the ways in which networks affect international politics in ways not expected by most realist theory. And I think he's right to argue that Slaughter's focus on joint-gains functionalism is misplaced optimism in many cases. But I think the lesson from these corrections is not necessarily that international politics is a space for contagion to spread in unknowable ways, but rather that we need to situate political actors within a structural context to understand how they shape policy and respond to events. *I'm heavily influenced in this by the research and teaching of UNC prof Graeme Robertson, who has written about and discussed the Arab Spring here and here. His current research is on contentious politics in post-Communist states. **For one example of this see Charli Carpenter's recent IO article on gatekeepers in advocacy networks. ***In other words, depending on the analysis, we may need to complicate states along lines that Farrell suggests. Sometimes the subtle two-step that Drezner advocates will be fine. As Bear Braumoeller notes in comments to Farrell's post, endogeneity problems quickly emerge when you try to internalize everything into network analyses. Nevertheless Farrell is correct in saying that if we think of world politics as a complex adaptive system (and we should), then problems quickly emerge when we "black-box" any one level of analysis. Unfortunately there's no simple solution for this, but there are ways to gain tractability by shifting focus from one level of analysis to another without completely losing sight of the other levels. That is in reference to eurobonds, which Merkel (along with 75% of German citizens) does not support. She understandably does not want to share Germany's credit rating with heavily indebted countries. But markets have been making Germany make political decisions for several years now, and that will continue. Merkel never wanted the EFSF. Merkel never wanted the compromising of the ECB. Merkel never wanted Germany to be on the hook for the whole eurozone. But markets have forced her hand at every juncture, and is still. The current EU policy of muddling through is precisely about "following the markets". Intervention is only done when markets force the hands of EU leaders. This makes perfect sense in game theory where every intervention is unpopular with at least one set of voters. In such a model markets would not only influence politics, politics would be very difficult without them. The fact that markets can alter the equilibrium makes it a very important political actor. Anti-neoliberals may view this as a tragedy ("markets undermining democracy"), but recall that the problem has arguably gotten this dire because of too little bond market discipline during the 2000s, not too much. "Financialization" refers to the increasing importance of financial markets, financial motives, financial institutions, and financial elites in the operations of the economy and its governing institutions, both at the national and international levels. This paper considers one aspect of financialization: the increased use by central banks of "inflation targeting". An extensive review of the literature shows that there is little evidence that inflation targeting reduces the costs of fighting inflation. Moreover, I present new evidence that, with respect to moderate rates of inflation – under 20% -- there are few macroeconomic costs of inflation. Hence, central banks' focus on inflation targeting cannot be explained by a "rational" social cost/benefit calculation and therefore, political economy analysis must be employed to explain its widespread use. The paper explores a "contested terrain" approach to understanding central banks' preoccupation with inflation fighting, an approach which concentrates on the relative interests of finance, industry and labor with respect to macroeconomic policy. I suggest that, in the case of the United States, financialization during the 1990's led to a closer alignment of large industrial and financial firms in the U.S., leading to a greater emphasis by Alan Greenspan and the U.S. Federal Reserve on financial asset appreciation as a goal of monetary policy. In the conclusion, I explore the contradictions and limits of this as a basis for sustained, expansionary monetary policy for the U.S.
We've discussed this sort of thing regularly on this blog, so some readers may find it of interest. Posted by Kindred Winecoff at 3:44 PM . The opposite argument is coming from a liberal set of social scientists, who say the data shows the public is demanding a more open and competitive political model. The economist Mikhail E. Dmitriyev — whose research group was originally founded to shape Mr. Putin’s economic platform— began warning of a “pretty abnormal” spike in dissatisfaction he observed in political focus groups, first among middle-class Muscovites and then appearing in other large cities. This brings to mind Fabio Rojas' post from the other day. In this case social science is being used to undermine democracy, but only by making Russia's "competitive autocracy" more responsive to citizens. Which is supposedly a key element of democracy. Interesting stuff. - Social scientists may discover that popular behaviors have bad outcomes. - Social scientists may discover that popular government policies have bad outcomes. - Social scientists may find that policies favoring certain political, social or corporate actors may be bad. You might think of this as the Ibsen view of politics and social science. And you see this already. It’s now a ritual among some politicians to trash social scientists. I believe my thoughts on social science are pretty idiosyncratic, but it has always been part of my thinking that social scientists should have a pretty strong streak of contrarianism in them. This can manifest itself in different ways. There's the lack of one-handed economists, eg, but what I really mean was once articulated by Christopher Hitchens like so: "Sit me down across a table with an ashtray and a bottle on it, and cue the other person to make an argument, and I am programmed by the practice of a lifetime to take a contrary position." This is not contrarianism for its own sake, but instead a constant probing and refinement of argument and evidence, as if it were a battle. Which it is. In any case it's an impulse for me, as fellow students and professors who have been unfortunate enough to have me in seminars would no doubt attest. More than anything else that impulse is what attracted me to academia in the first place. Other social scientists seem not to share this impulse, instead enjoying the pursuit of consensus. And there's nothing wrong with that. I certainly don't want to disparage hard-won insights from social science that enjoy broad acceptance among experts. There's usually very good reasons why they are broadly accepted. But the enduring works in almost any social science field -- some of my favorites in political economy are Hume, Mill, Smith, and Marx -- are those which seek to overthrow the received wisdom rather than reinforce it. Even intellectual failures can be much more interesting than successes. My original thought was that good social science research that shows that torture does not extract useful intelligence information would be the final nail in the coffin in any public argument in support of torture. But what happens if one of us gets access to the relevant data, does the empirical analysis, and then discovers the opposite: that torture does lead to useful intelligence information. What do you do then? Sit on the results? Would any political science journal publish such a paper? How would that look in a tenure review? (“Right, she’s the one who said torture was valuable…”). I couldn't imagine not publishing that paper if I'd written it. Not because I think such a finding would suggest that we should torture more, but because I think that moral and intellectual progress comes from tackling difficult questions head-on rather than shrinking from them. And because I strongly believe that all beliefs, especially core beliefs, must be carefully weighed against the best arguments in opposition to them. Without that there's no point in any intellectual enterprise. I'm very much a Mill-ian in that respect. I agree with Rojas that social scientists often avow the merits of democracy despite the fact that much of our own research, behavior, and intuition suggests that democracy has deep flaws along many dimensions. Many of our assumptions about democracy do not actually make much sense in theory, and the empirical record is equally spotty. I think that many social scientists are too slow to ask who benefits from political institutions, and to quick to assume that in the case of democracy the answer is more or less "everyone". But we know that isn't true. I was recently reading debates from state legislatures over constitutional reforms (at the state level) in America in the 1820s, and it was amazing how up-front some statesmen were in arguing that democracy threatened their interests, while their opponents admitted that that was indeed the point. Of course the whole point of constitutions as legal documents is to restrict democratic tendencies. So why should we start from the assumption that democracy is somehow normatively "good"? Good for who? I don't really have a takeaway point for this post, other than I'd like to see more social scientists really question core assumptions, admit (and then defend) the normative biases in their work, and give more value to interesting intellectual experiments, even interesting intellectual failures. What makes the Swiss situation so remarkable, however, is that it affects not just ultra-short rates. On Friday, futures markets predicted negative rates until 2013 (and minus 8 basis points next summer). This is unprecedented. There is a huge surplus of demand for safe assets over supply. The Swiss government is not able or not willing to supply any more francs without getting something for it, because currency appreciation is killing their exporters and driving imbalances that could be painful to unwind. So maybe, just maybe, a much larger country with a much greater ability and capacity for the production of safe, liquid assets should do more to stabilize the international financial system. In other words, the US should be much more in debt than it is. 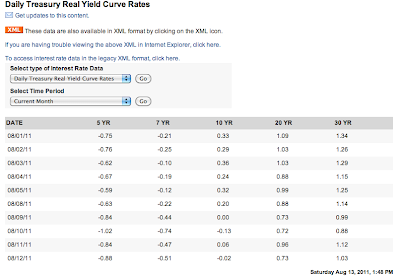 The United States government can borrow at negative yields out to 10 years. 1% out to 30. And the response to that? A downgrade, and both political parties freaking out about borrowing. To twist the (stupid) expression common among politicians, if the US government were a household we would not have to live within our means, because other people are willing to pay us to take their money. And if we ever were faced with a situation in which we had to pay, we can always just create new dollars ex nihilo. Which only households with money trees in the backyard can do. And yet we do nothing. Is there any historical analogue to this? Posted by Kindred Winecoff at 2:20 PM . An excellent discussion of realism in IR theory throughout history by Daniel Trombly, a very talented George Washington undergrad. Recommended. Posted by Kindred Winecoff at 11:30 AM . Michael Lewis continues his Euro-crisis tour, this time popping up in Germany. Like previous installments in Iceland and Ireland, Lewis has found a curious (and probably grossly exaggerated) cultural trait that -- whaddyaknow? -- has surprising relevance for the crisis. In Iceland it was fear of underground elves; in Ireland it was fairies. In Germany? The duality of scheisse. (I'll let those of you that have forgotten your foreign curse words from middle school look it up.) Also Hitler. As always with Lewis it's a very interesting piece. Also as always, I'm not sure he gets to the true center of his subject. Actually, that's not true. He does, but usually very briefly and with a key component left out. He mentions Germany's willingness to accept the eurozone as a sort of penance for the Holocaust, but not that it was related to European reticence over reunification. He mentions that other countries used Germany's credit rating to borrow more than they should, but chalks up Germany's frugality to some inherent character trait, perhaps related to long memories of the 1920s hyperinflation. Humorously, he allows his translator/chauffeur to blow apart his thesis midway through -- "How do you generalize about 80 million people? You can say they are all the same, but why would they be this way? -- but then continues on with it anyway. But a few things come out from the article anyway. First is the unsophistication of German bankers, at least relative to their American counterparts. This, too, is a common thread running through Lewis' discussions of Iceland and Ireland. Second is the fact that German bankers took AAA ratings at face value. Of course so did lots of other investors, including American bankers, which undercuts his "German unsophistication" argument, but whatever. Third is the politics, which he barely touches on but which is obviously the most important aspect of the creation of the crisis and the responses to it. In Lewis' story, Germans are austere and hard-working while Greeks are lavish and lazy. Of course this view is common, but it is also highly questionable. For example, did you know that on average Greeks work later in life than Germans, French, or Italians? Or that a substantial amount of Greek's debt was accumulated by borrowing from France to buy French weapons to deter Turkey? Greece has a major problem with tax collection and productivity, but many of these concerns are caused by or exacerbated by the German dominance of the ECB and Euro economy. Lewis writes that Germany has become Europe's daddy, but don't the parents get some blame when the children misbehave? Lewis also presents contradictory views of the German political environment. On the one hand, Germans are portrayed as docile and demure, eager to demonstrate their commitment to Europe and the international community, willing to sacrifice quite a lot to those ends, shamed by displays of nationalism, and almost masochistic in the "memorialization" of their own ugly past. On the other hand, they are PISSED OFF at the rest of Europe and aren't going to take any more of this scheisse from the rest of the continent. Well, which is it? Lewis' essay is fun reading, but I'm not really sure how much can be learned from it. As always there is a bit of financial mechanics for the uninitiated, and some interesting characters that tell interesting stories -- look for the one about Commerzbank, Deutsche Bank, and the urinals in the men's bathroom -- but give no clear sense of why things happened, much less what's going to happen. Lewis is interested in narrative not analysis, and his sense of politics has always been immature. He's much more interested in culture, and especially the culture of Wall Street and the ways in which it differs from other cultures. Which is all fine and good, I guess, but it limits the importance of what Lewis can say. PS: I now see that Kevin Drum and Felix Salmon had a similar reaction, except more revolted. Why Hasn't Academic IPE Had Anything to Say About the Crisis? In short, I would argue that no articles directly relevant to the financial crisis have appeared in IO because the field attaches little value to studying the US crisis in isolation, and the banking crises with which it might share common properties are so infrequent that statistical techniques are unlikely to identify general relationships. As a result, an event of supreme global importance gains very little attention from American IPE scholars. The fundamental problem is that IPE imagines a world quite unlike the one we actually inhabit much of the time. As a consequence when we are asked to comment on the world we actually inhabit, we have little to say. My comment on Nexon's original post was basically what Blyth said: according to Louis Pauly, one of IO's editors speaking at this year's ISA meeting, there haven't been any submissions related to the GFC. It's hard to publish on a topic when you don't have any submissions. In comments to Nexon's original post, Len Seabrooke -- also an editor at RIPE -- said that the lack of submissions is self-selection, and that academics interested in influencing policy are unlikely to look for publication in an academic outlet like IO first. More generally, this is a marked shift from IPE's early days when the field was focused around questions of complex interdependence. The shift away from that sort of research has been mostly pragmatic and for mostly good reasons, but it isn't unreasonable to think that something has been lost. Robert Keohane called this the "suppression of the 'I' in IPE", and views it with a "gnawing sense of dissatisfaction". It seems that a growing number of scholars feel similarly. Posted by Kindred Winecoff at 10:23 AM . [O]n the basis of just its fiscal statistics, the U.S. would have been under pressure to accept an IMF program long ago. Of course, there are many differences between the US and the typical IMF borrower; the broader point is that the US can’t necessarily expect its “special” status vis-à-vis markets to persist indefinitely. In the U.S. case, the fact remains that Treasury securities are a favored “flight to safety” instrument for investors worldwide. When risk acceptance and global liquidity is high, investors look for high-risk, high-return assets – equity offerings in emerging or frontier markets, for instance. But when risk aversion is high, investors seek out safe havens. 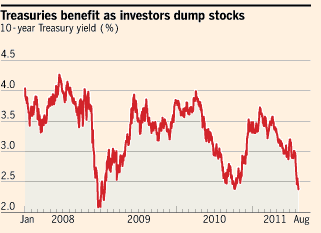 Treasury bonds have long been such a haven, both for domestic and foreign investors. Many holders of U.S. government securities are official entities (such as foreign central banks), while others are private investors. What other options do these safety-seeking investors have? There’s the Swiss franc. And there’s gold. Both have experienced surges in prices that come from the search for safe investments. But where else might investors go? Certainly not into euro-denominated instruments, given the continuing crisis in the euro-zone. And probably not into renminbi-denominated instruments; for all of the speculation that the dollar’s “exorbitant privilege” is reaching its end, don’t expect it just yet. The US is different from other countries that might go on to a IMF program in a lot of ways, but most importantly because it can create the most important store of value in the world, and it can do so whenever it pleases. Ireland, for example, cannot. Neither can Greece or Thailand or Malaysia or even Japan. Gold is limited by quantity, which is why prices are through the roof. Swiss francs are limited by the small size of the Swiss economy and its lack of centrality in the global economic system. The dollar is not only the most-used and most-traded currency in the world, it is also embedded in the global economy in ways that other currencies are not. The graph above was constructed with BIS data. (Just ignore the isolates like "OtherEMS" and "FRF", which aren't actually in the currency system anymore; I was too lazy to take them out before making the graph.) Node size represents the % of total global currency exchange in a country's currency, and tie thickness represents the (bilateral) size of currency exchange between two currencies. 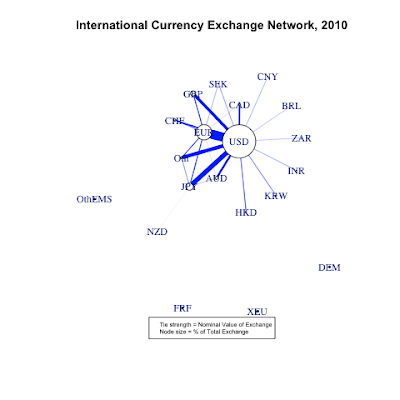 The US is obviously the most central node and is also the largest by far; Swiss francs ("CHF") are much smaller and only has ties to Europe and the US. For the rest of the world shifting out of dollars into the Swiss franc isn't even really an option. For that matter, neither is the euro or yen. Only the US dollar has a truly global reach. Network externalities can be very powerful. If everyone in the world is using dollars as a medium of exchange, it makes sense for you to use dollars as a medium of exchange. And if you use dollars, then your trading partners and counterparty investors benefit from using dollars. This effect reinforces itself as it spreads through the international economic system. Self-reinforcing patterns are path-dependent in complex networks; it usually takes the destruction of the entire system to reverse them. And since the US is the only country that can create dollars, it has a very important capability that countries on IMF programs do not: the ability to service its debts with paper, with a strong presumption that it will not be punished for doing so as long as network dynamics remain self-reinforcing. So far the lesson from the S&P downgrade is that those externalities are not only still in effect, but are intensifying. In other words, the US's peers are not Greece and Ireland, or the countries involved in the 1990s Asian flu. The US's peers are not even France and Germany, which are large industrial countries but do not control the printing press. Nor even Japan, which is sustaining a debt/GDP of nearly 200%. 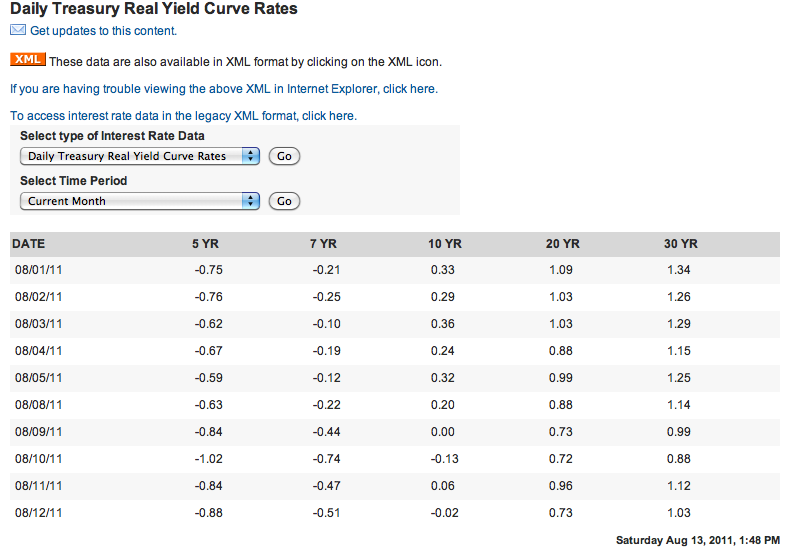 The US has no peers, and this shows up in the bond market data (to be discussed in a future post). Several times in her post Layna explicitly or implicitly references Barry Eichengreen, who has written a lot on capital, debt, and currency. In a recent column, Eichengreen argues two things. First, that the argument of his recent book Exorbitant Privilege is essentially wrong: the global currency system will not move to a USD/euro condominium in the near term, because "a pox has been cast on both their houses". Second, that there are no other viable alternatives in the form of national currencies -- he explicitly mentions the Swiss franc, Canadian dollar, Chinese RMB, and Australian dollar as being insufficient, despite being the main contenders -- and international baskets like the IMF's SDRs suffer from a lack of liquidity and over-exposure to the USD and euro. So he suggests moving to global GDP-indexed bonds. But this ignores politics. If Europe can't even issue Euro-bonds, and if SDRs are unattractive for a number of reasons, why should we think that a global effort will be more successful? So I agree with Layna: the era of "exorbitant privilege" is not only not over, but this crisis has seemingly reinforced it. You don't hear much talk about "decoupling" these days. Posted by Kindred Winecoff at 4:40 AM . Apologies for the light posting. I've had fairly severe computer problems that necessitated the purchase of a new one, then an epic struggle with FedEx to actually get the damn thing in my hands. Obviously the past week has been a bad one for an IPE blogger to go missing, but I'm back in business now. So a few rapid-fire thoughts on the week that was. 1. S&P: This is clearly an attack on the US political system, not the fundamentals in the US economy. (The fact that the GOP hasn't internalized this lesson is bad news for them, methinks.) Nothing changed with the US's debt situation, and the solvency of the US is not under question by anyone in the market (more on this in a later post). For this reason the sloppy math in the initial S&P report doesn't matter... it's not about the math. It's about the legislative process. S&P prefers a cleaner one. I guess it's fine to have that preference, which I share but do not expect, but if this downgrade is about political risk than S&P really should have consulted some political risk experts, legislative affairs experts, or political scientists more generally. They also should have talked to folks who study global political economy, since rapping the US's knuckles can have far-reaching effects if done wrongly. All said, the actual downgrade wasn't too significant, because the US didn't actually default. US bonds are still investment grade, and yields are at historic lows. The credibility of S&P, not the US, is what was severely damaged with this decision. 2. Europe: How long can this go on? The sovereign debt trouble is spilling over into the banking sector more rapidly. The biggest worries now are about Société Générale, and with good reason: it's the second-largest bank in France and the eighth-largest in the eurozone. It was already helped indirectly by the AIG bailout and directly by the Fed's international activities through TAF, but pressures mount and SocGen is definitely systemically important. Tyler Cowen and others have written about the silent bank run in Greece, and how an exit from the eurozone would affect Greek banks, but it would also affect banks in the Euro core. The ECB is finally starting to act like a central bank, but either way the game has irrevocably changed. As far as I can tell the ECB's current actions are illegal under Article 123 of the Lisbon Treaty, but I'm no EU legal scholar so I could be wrong about that. In any case it seems to me that the eurozone must change somehow. Either by contracting members, dissolving into a two-track union, or centralizing more authority in a federal system. 3. Fed: It now appears clear to me that Ben Bernanke has been hamstrung by a Board that doesn't understand how or why the Fed should be more active. There were three dissents from the most recent, tepid, statement that interest rates would remain low for two years -- a statement that will be interesting to track, as it has credible commitment issues -- and there is no sign of further action. This is a shame. It's also a shame that Obama has left key Fed spots empty for so long. It seems like he'll be nominating Jeremy Stein and Richard Clarida for two empty Board spots, and Daniel Tarullo to the vice-chair spot that heads the regulatory apparatus of the Fed. I'm familiar with Stein's and Tarullo's academic work, and it is very good in both cases. But this is not enough. The Fed needs to much more active in changing expectations about the path of the nominal economy. It needs to make much more credible commitments to boosting economic activity. It needs to play a greater role in the international banking system to avoid another panic at a crucial time in the "recovery". It, in short, is the most powerful economic agency in the world, and it needs to start acting like it. It has great capabilities, but also great responsibilities. 4. Equity markets: A lot of people are saying that this is like 2008. This is not like 2008. In 2008 credit markets had frozen up entirely, the whole system lacked liquidity, and every major financial institution was in the process of realizing very large losses. That's not the problem today. The problem today is that economic growth has been weak and will remain so for the foreseeable future, and governments are either unwilling (US) or unable (EU) to do much of anything about it. These are the countries that drive global demand, so if they slip up it hurts production in the developing world as well. “It is the irony of the downgrade,” says Lou Crandall at Wrightson Icap. “What do you do if the US is downgraded? The answer is, buy more Treasuries.” Two and three-year Treasuries hit record lows of .23 and .48 percent. 10-year notes fell to 2.33%, their lowest yield since January 2009. Do we really close this loop by asserting that the downgrade caused the sell off? Posted by Kindred Winecoff at 11:19 AM . At the end of my previous post, I suggested that we might not always want to force people to internalize externalities. This is anathema to most economists and indeed believers in the market as the most efficient allocator of resources. After all, if the market allocates efficiently, and externalities are market failures, then externalities should be corrected. In many cases this will be true, but not, I think in all. First the argument in favor of internalizing externalities. In the case of positive externalities, if the people generating the benefits are not able to capture the value of those benefits, then they will tend to not produce those goods. Even if these are not public goods, wealth creation is good for its own sake as people will tend to enrich others' lives with their innovations as well as use their wealth to employ other people*. In other words, we want people who are capable of creating new things to create those things, ceteris paribus. If people are not compensated for doing so, they will tend not to bother, or so the argument goes. In the case of negative externalities, if people are not forced to internalize those costs they will tend to over-produce those goods. That's bad for society as well. To see where this can go wrong, let's take an extreme example. Bill Gates has been the world's richest man, although he's currently #2 behind Carlos Slim. What's more, no one believes that Gates has secured his wealth illegitimately. However, the benefits to the economy of Microsoft's products have not all been captured by Gates. As intermediate goods, Microsoft products allow people to produce other products, and to do so more efficiently than they otherwise might. Though I can't find the study now, a few years back someone estimated that Microsoft had generated hundreds of billions of surplus value to the economy, mostly by reducing transaction costs, improving efficiency in a number of business environments, and generating network externalities. These innovations have literally benefitted hundreds of millions, if not billions, of people all over the world. You can probably see where I'm going with this. The fact that Gates has not been able to internalize all of the benefits from his products has not stopped him from creating and distributing them. On the contrary: in order for Gates to be as wealthy as he is he has to make sure his products are broadly dispersed, which is why he gives some of them away for free. He has been rewarded very well, but no utilitarian calculus that I'm aware of would suggest that we should redistribute away from ordinary people who have benefitted from Microsoft to Gates. He has more than enough. So we should modify the common claim at the beginning: internalizing (positive) externalities only needs to be done when we're operating near the margin where innovators might choose not to innovate without more compensation. And if we think in those terms, it isn't immediately obvious that we're usually operating at that margin. It is well-known, for example, that popular live music events are generally "inefficient" in that they usually sell out quickly, which indicates that there is quite a lot of surplus that is being captured by consumers rather than producers (or other consumers, who might be willing to pay more for a ticket in an auction setting). Economists generally think this is puzzling, but from a utilitarian perspective it's arguably a very good thing. How about negative externalities? Arguably this is a more difficult case, but if we keep using the same utilitarian logic I've presented it isn't hard to argue that poorer people should be given some license to push negative externalities onto richer people. People have used this sort of argument to suggest that developing countries should not have to adhere to the same climate change restrictions that richer countries should adhere to. The question is where the margin that tips over into inefficiency lies. I admit that these cases will be much more in the eye of the beholder than the case in which Gates' positive externalities are broadly shared, but there isn't any ex ante reason to discard the idea. *You don't have to be a believer in strong-form trickle down economics to generally accept this point. In a classic example of a tragedy of the commons, a field is used by several farmers to graze their cattle. None of the farmers have the right to restrict access to other farmers. The field can support a certain number of cattle, say ten, without being depleted. But any additional cattle added to the field beyond ten will deplete the field and everyone will suffer. In this case, every farmer has an incentive to add the eleventh cow, as the benefit from doing so will accrue only to that farmer, while the costs will be shared by all. Therefore, the owner of the eleventh cow has imposed a negative externality on the owners of the ten when he brings the cow to the field. The tragedy is that because individual incentives deviate from collective incentives, and there is no external enforcement, everyone is bound to suffer. This example, or one like it, is used to illustrate many problems in the world. Pollution, overpopulation (as in the original Garrett Hardin article that I believe remains the most-cited in the history of the journal Science), climate change, financial regulation, etc. In many cases, we focus on the ability of institutions like government, property rights, or bargained contracts to overcome this tragedy and ensure a more efficient outcome. The problem is that it makes no sense. At least, it makes no sense when translated into the language of externalities, which nowhere appear in Hardin's original article. To see why, remember this: there are no property rights in the commons. So while the eleventh cow is the one that puts the commons over the edge, this is only true because of its cumulative effect with cows one thru ten. Were any of of those ten absent (i.e. not just the eleventh), the presence of the eleventh would be no problem. Since no farmer has any more or less right to access the commons than any other, all the farmers are equally culpable when the commons becomes depleted. The owner of cow #11 is doing no more (or less) damage than the owner of cow #4. Since all are culpable and all share the cost, there is no externality. All the farmers are contributing equally to the problem, all are equally suffering the cost. The removal of any of the cows would solve the problem, and there is no established reason for the claim that the eleventh cow is the one that should be removed. The logic of externalities requires an established property right that is being infringed upon. It also requires that someone is forced to pay the costs of an action without accruing the benefits from it. When we realize this, we also realize that the problem of externalities is a much smaller one than we first thought. It does extend to manufacturers that pollute a river that makes fishing impossible downstream, but only if the fisherman has a claim to the river and does no polluting on her own. It does not extend to a financial crisis that culminates in some people being unemployed or losing wealth via asset depreciation, unless (perhaps) the crisis was caused by fraud. The question that remains: what about climate change? Is this an externalities problem? Every society that has the capability to pollute does so, albeit at differential rates. While the infamous Summers memo was obviously sarcastic, there is a kernel of truth embedded in it: pollution is a by-product of economic activity, all of which generates waste, and the lack of which is a greater threat to human well-being in the developing than climate change. The pollution levels of even low-polluting industrial countries like Japan would be more than enough to warm the planet if all countries polluted at that rate. This is analogous to the owner of the eleventh cow: whenever anyone comes into possession of this cow, they will add it to the commons and everyone suffers. We don't fault the owner of the eleventh cow for ownership, we fault the structure of the interaction. If the only difference between the culpable and non-culpable is opportunity, can we really feel comfortable ascribing blame? Secondly, is it really clear that people in Bangladesh (say) have a rights claim to an climate environment that is not two or three degrees warmer than it is right now? How did they acquire this right? This is an important point when considering the politics. Some countries, such as Russia and Canada, will likely benefit from a warmer climate. Some countries will suffer. Some countries, like the United States, will probably not be greatly affected in aggregate, but within the country some groups will benefit while others will suffer. Similarly, taking large efforts to prevent or mitigate climate change will benefit some and harm others. How do we resolve this without some sense of who has what claim to what type of climate? None of which is to deny that even if climate change does not represent an externalities problem, it nevertheless may constitute a human problem. And really I'm less interested in climate change per se as I am in the fact that the tragedy of the commons is not necessarily an externalities problem as we usually think. I'm planning to follow this post with another post on why we might not want to force people to internalize externalities in all contexts. Posted by Kindred Winecoff at 6:25 AM . New European Union rules designed to make the financial system safer would require banks operating in Europe to raise an estimated €460bn in capital by 2019 or substantially reduce their risk and balance sheets. The draft proposals unveiled on Wednesday – which still need approval from the 27 member states and the European parliament – make the EU the first jurisdiction to start implementing the global Basel III capital and liquidity guidelines that were adopted last year. Industry groups in the UK and Germany warned that if the EU moves too far ahead of the rest of the world, its banks could lose out to international competitors and cut lending to the real economy. The projected capital shortfall, equivalent to 2.9 per cent of all the EU banks’ risk weighted assets, goes a long way towards explaining why EU banks are among the fiercest critics of the Basel III proposals. Banks and some other groups argue that this will have an adverse effect on economic growth at a time when the EU can had afford it; while there might be some truth to that some new research shows that too much finance can actually retard growth, and that this is currently the case in some EU countries. The EU’s draft proposals are likely to unleash months of heated debate, as member states and banking institutions haggle over the details. Some countries – including the UK – are still fighting for the flexibility to introduce national requirements that are higher than the EU minimums. If competitiveness is such a big worry then why would any states have stricter requirements than required by international agreement? Note that this is nothing new; the US had stricter capital requirements than Basel I and II in order for firms to be considered "well capitalized" by the FDIC. And World Bank surveys conducted in 1999, 2003, and 2006 showed that 40-50% of countries had capital standards stricter than the Basel minima even before the financial crisis. The above heat map shows those results in 2006*. Since the crisis many countries have proposed or enacted new regulations that are tighter than their international obligations. Most existing literature on regulation in finance, economics, or political science does not expect this type of behavior by governments**. Episodes like this suggest that we need to complicate our expectations about the ways that domestic and international politics interact, and the process by which governments set policy in a competitive global economy. It isn't unidirectional neoliberalism, even before the crisis. This is the focus of my dissertation research, so I'm sure you'll all be hearing plenty more about it in coming months. For now let's just say that this type of behavior follows the precedent of previous periods of crisis and regulatory reform. *Darker colors indicate higher capital requirements. White is missing data. The Basel minimum of 8% is the light orange, as in the US. Note that much of the variation on this variable is in the developing world. **Or the equivalent behavior of firms, which "over-comply" with capital regulations as a rule, albeit at different spreads.